Neo-angle showers have become increasingly popular in recent years. Traditionally, prefabricated neo-angle showers have been used to save space. However, use of tempered glass in modern neo-angle showers has lead to designs becoming much more versatile and luxurious. What is a Neo-Angle Shower? Frameless glass neo-angle showers are made using between three and five tempered glass panels. Panels are used to enclose a full bathroom corner. At the same time, designs are often complemented by waist-high knee walls. 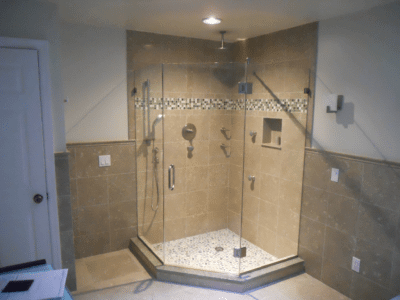 This makes neo-angle showers the go-to design choice for seniors and people with mobility problems. Thanks to their transparency, frameless glass neo-angle showers allow light to diffuse freely in bathrooms. As a bonus, using tempered glass panels and doors allows for a wide variety of customization options. At 808 Glass in Toronto, we are the preferred choice of frameless glass contractor for both local homeowners and property developers. Using 100% safe tempered glass, we supply luxurious neo-angle shower designs to homeowners, hotels, and professional bathroom remodelers. We custom fabricate glass panels and shower doors to fit the precise dimensions of bathrooms. Much more importantly, we offer a comprehensive warranty on every new frameless glass shower installation undertaken by us. Neo-angle showers are perfect for both small and large bathrooms. If you are looking to transform the look of your bathroom, simply call or contact us today to benefit from a fee, no-obligation initial consultation.